The Milo Andrus Family Organization commissioned new research into the ancestry of Ruluf Andrus, Milo’s father. Read the report here: Ruluf Andrus research report 6_21_17 (PDF). This report, and other research reports, can be found on the Milo Andrus website: http://miloandrus.org/genealogy/research-reports/. Hyrum Andrus (Jane Munday wife line) served as the Genealogical Chairman of the Milo Andrus Family Organization and editor of the Andrus Recorder from 1964-1984. He was also the editor of Trumpeter of God: Fascinating True Stories of the Great Missionary and Colonizer, Milo Andrus published in 1992 and wrote some of its chapters. 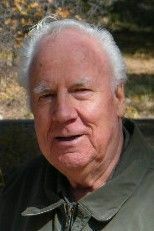 Hyrum Leslie Andrus passed away at home in Alpine Utah October 23, 2015. He was born March 12, 1924 to Newton Leslie and Zina Alberta Andrus of Lyman Idaho. He married Helen Mae Hillman March 31, 1949 in the Idaho Falls Idaho Temple. Hyrum was a dutiful servant and missionary to his God and church, a patriot to his country, a renowned scholar, author, lecturer and teacher with a Doctorate degree from Syracuse University. Hyrum was a loving, caring husband and father. Hyrum is survived by his loving wife Helen Mae; children: John Leslie Andrus of Elko, Nevada; Richard Milo Andrus of Stansbury Park, Utah; David Hyrum Andrus of Evanston, Wyoming; 16 Grandchildren and 16 Great Grandchildren; and his sister Nyal Merrell of Orem Utah. Funeral services will be held at 11:00AM, Thursday, October 29, 2015 at the Alpine 1st Ward chapel, 890 North Heritage Hills Drive, Alpine, UT 84004. Friends and family may visit at the church from 9:30AM to 10:45AM prior to the services. Interment will be at the Sutton Cemetery in Archer, Idaho. Obituary reprinted rom The Daily Herald. What are your memories of Hyrum? Post them below.